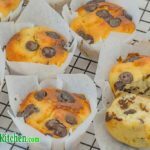 Keto Muffins Recipe - "Low-Carb Choc Chip" - Make a Batch They're Easy, YUM! Chocolate Chip Muffins are one of the most popular baked goods, and why should we, Ketogenic Dieters, have to miss out. We can guarantee you that you don’t have to miss out. Our Low Carb Chocolate Chip Muffins are so easy to make and are not only delicious, but also very moist and fudge-y. Place all ingredients, except chocolate chips into your stand mixer. Mix on medium speed for 3 minutes, until all ingredients are combined. Allow to sit for 2 minutes to allow the coconut flour to soak up the moisture. Mix again on medium for 1 minute, or until there are no lumps. Spoon mixture into 12 holes of a muffin tin lined with cupcake papers. Bake for 20-25 minutes. The muffins are cooked when an inserted skewer comes out clean, and the tops are beginning to brown.